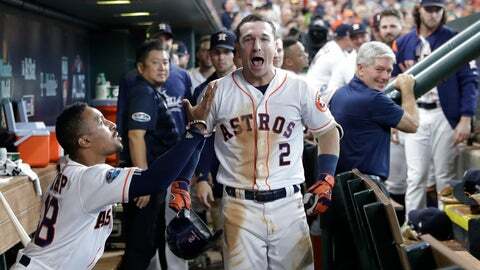 HOUSTON (AP) — Ask any Houston Astro and they’ll say the same thing: Alex Bregman was made for these moments. The young third baseman was great for the defending champions all season and now that the calendar has flipped to October he’s taken his play to another level, slugging two home runs to help Houston to a 2-0 lead in the AL Division Series against the Cleveland Indians. Game 3 is Monday in Cleveland. The 24-year-old Bregman had the best year of his career this season, leading the AL with a career-high 51 doubles, and setting career marks by hitting .286 with 31 homers and 103 RBIs. His breakout season helped carry the offense in a year where last year’s MVP Jose Altuve and star shortstop Carlos Correa struggled with injuries. Bregman gave Houston its first run of the playoffs this season when he hit a solo homer off Corey Kluber in the fourth inning of Game 1 on Friday. It was the first of four homers hit by the Astros in a 7-2 win. The Astros were up by 1 in Game 2 on Saturday when Bregman connected off Trevor Bauer with two outs and none on in the seventh to add some insurance in the 3-1 victory. Bregman, the second overall pick in the 2015 draft, hit four homers and drove in 10 runs in his postseason debut last season to help the Astros to their first World Series title. He homered twice against the Dodgers in the World Series, and his two-out single in the 10th ended Houston’s thrilling 13-12 win in Game 5. Selected as an All-Star for the first time, he hit a tiebreaking home run in the 10th inning at Nationals Park in July that sent the AL to victory. Bregman never seems daunted by important moments despite having played just two full seasons in the majors. Manager AJ Hinch said Bregman has a “calm heartbeat” and he knows the Astros can always count on him when they need a big play whether it be on offense or defense. Though Hinch and the Astros have come to expect this level of play from the former LSU standout, the manager sometimes takes a step back simply to appreciate his greatness. Altuve, who became the first Astro to win MVP since Jeff Bagwell collected the National League award in 1994, has been wowed by Bregman’s development this season. In a stacked MVP race led by Boston’s Mookie Betts and J.D. Martinez and Angels star Mike Trout, Altuve believes that his teammate’s season was the most impressive. Bregman isn’t interested in discussing individual awards and accolades and says his only focus is helping the Astros repeat as champions. And as much as he’s done so far, he’s constantly working to do more and get better. “This was definitely, definitely something I envisioned doing, (but) I think there’s so much room to improve on both sides of the ball, and I look forward to working on it,” he said.